Bailey's Backyard continues to be one of our favorite spots. 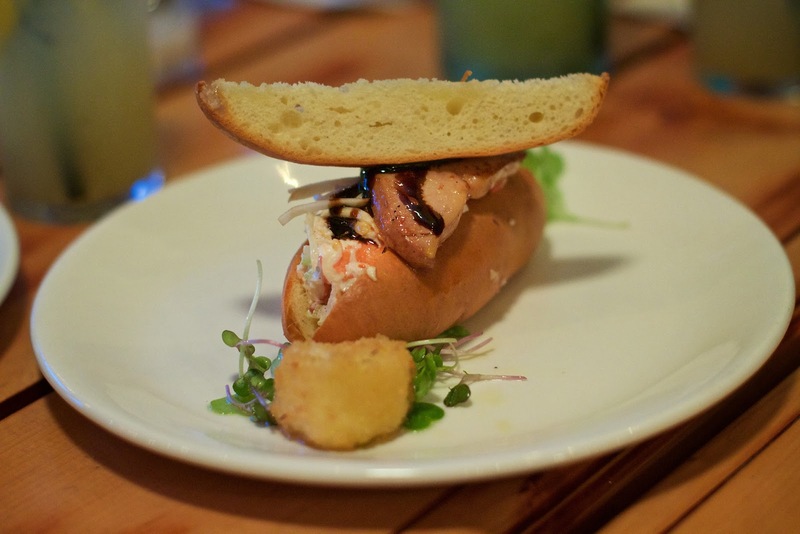 Recently, owner Sal Bagliavio and chef Forrest Pasternack invited us to sample the latest summer season creations. It did not disappoint. 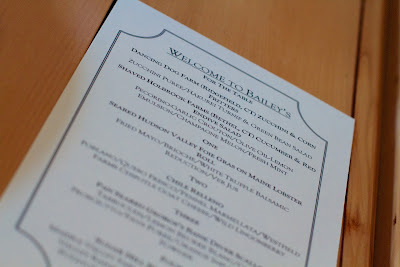 What we love most about Bailey's is the use of seasonal ingredients, the ever-changing menu, and the inventive combinations of flavors and textures cooked up in the mind of Chef Forrest. I'm hungry just thinking about it. Let's get the details of what they have in store for summer. We started with The B's Knees cocktail. 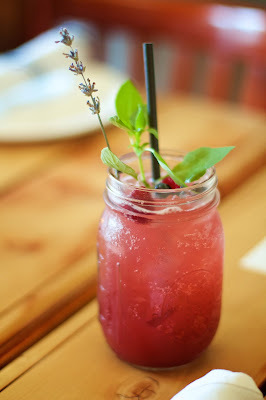 The drink is made with Glenbrook plum gin, blackberry/lavender syrup, lime juice, fresh berries and garnished with house grown lemon basil. This is a boozy lemonade, perfect for a summer evening. It is sweet yet refreshing. I can picture drinking it on a wraparound porch while swaying on a porch swing. The first dish was a Shaved Holbrook Farm Cucumber and Red Endive Salad with Pecorino-garlic crouton, olive oil lemon emulsion, champagne melon, and fresh mint. Talk about summer on a plate! Chef Forrest commented that it's been a good year for melon and I cannot disagree. The melon was amazingly sweet. It matched perfectly to the bitter endive, salty crunchy crouton, and fragrant, floral cucumbers. 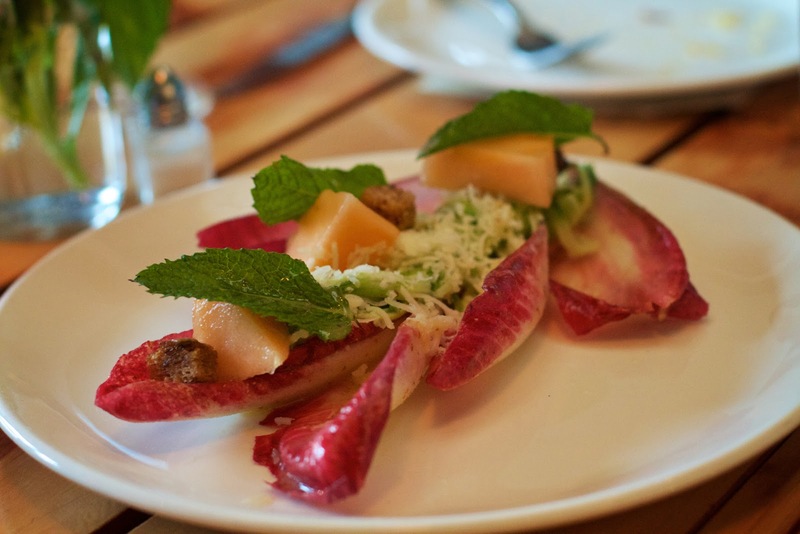 For those of us who love salad, this is one for the books. Next we shared Dancing Dog Farm Zucchini and Corn Fritters with a zucchini puree, hakurei turnip, and green bean salad. The tempura-style batter on the zucchini flowers was light and crisp with a cheese filling that added a hint of creamy flavor but was not overwhelming. The corn fritters, on the other hand, were hearty with a crunchy outside and moist cake-like inside. 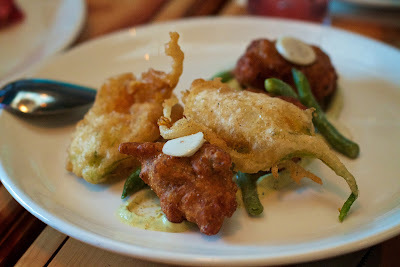 The corn fritter was good, but man those zucchini flowers were delightful. 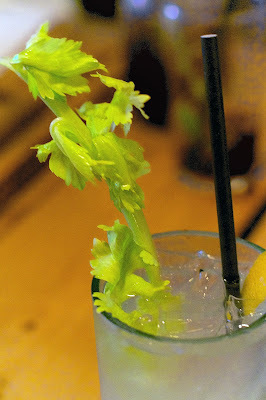 Our second cocktail was The White Mary, made with cucumber infused vodka, celery simple syrup and elderflower liqueur. For me, this was a total miss. 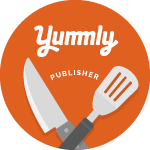 While a few of my fellow writers at the table loved it, I found it way too sweet. I took two sips and was done. To go with the cocktail were two plates in the Starters menu category. The first was the Seared Hudson Valley Foie Gras on Maine Lobster Roll on brioche with white truffle balsamic reduction, ver jus, and fried mayo. Indulgent, yes, but not heavy. 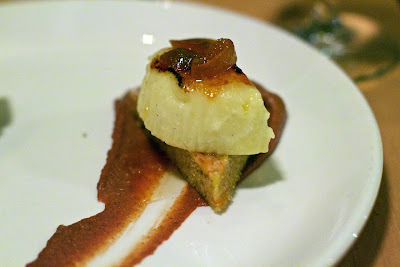 I expected more of a flavor punch from the foie gras, it wasn't as prominenet as I thought it would be. The second Starter was the Chile Relleno. 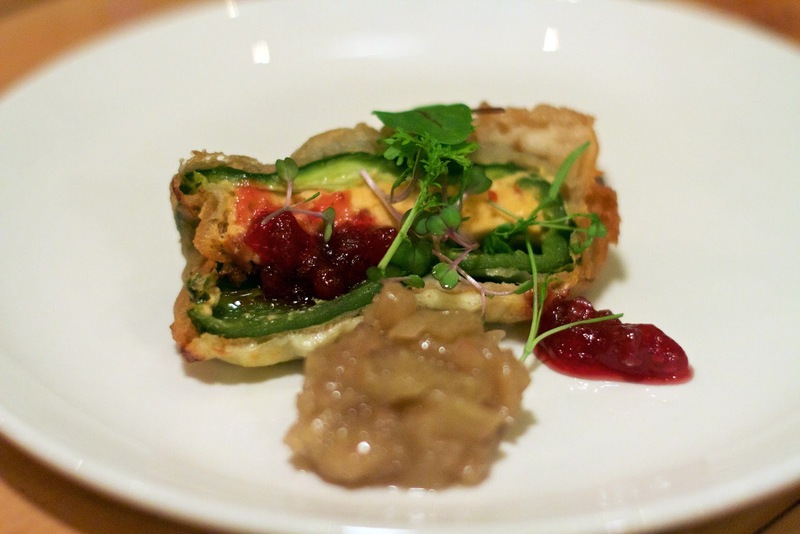 It was a poblano pepper stuffed with Westfield Farms Chipotle Goat Cheese dipped in batter and fried, then topped with melted queso fresco and a touch of wild lingonberry, and served with fennel marmellata. Wow. It was a match made in heaven - sweet, spicy, creamy, tangy, and savory. The third Starter for the night was Pan Seared George's Bank Diver Scallop served with tabbouleh, lemon beurre blanc, crispy prosciutto, fava puree and orange infused olive oil powder. This was served with the Captain Lawerence Kolsch beer. 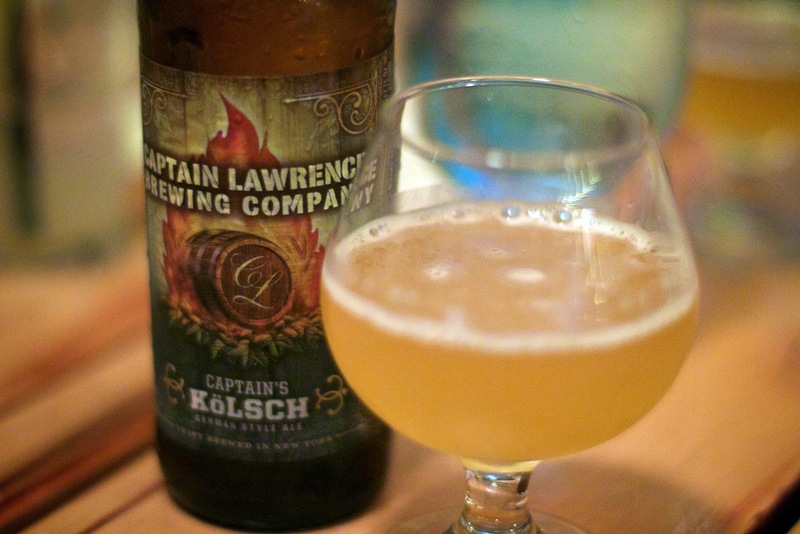 I'm not a big Kolsch fan, but it's an easy drinker especially for summer. As for the dish, I loved the play of texture here. 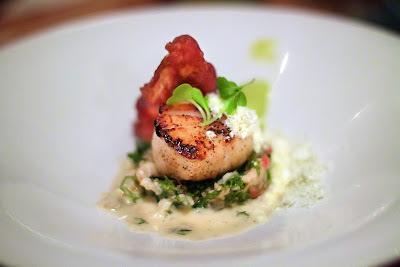 The scallop was tender, fresh and smooth against the crunchy, salty prosciutto. Both played well with the earthy, creamy fava bean puree and the fresh flavor pop from the tabbouleh. As for the main course, well, I think Chef Forrest knew his audience well because it was pork. You know, I cannot resist pork. However, before I get into dreamy pork land, let me talk about the cocktail paired with this course. 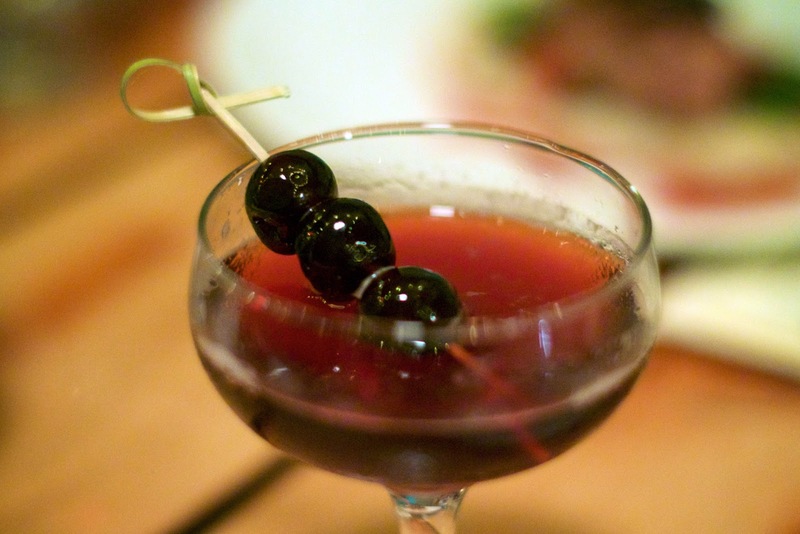 It was the Black Beauty Manhattan, featuring Woodford Reserve Bourbon, Ruby Port, Orange Bitters and Black Cherries. It's gently sweet with a big smokey, bold kick. Now this is my kind of cocktail. And what a match for pork loin. Speaking of the main course, it was Sugar Hill Berkshire Pork with Marble Valley Farm sugar snap peas, shaved Jansal Valley rainbow carrot ribbons, whipped red potatoes, red grape vierge, and a chickpea crisp. 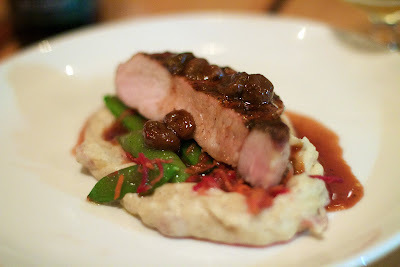 The pork loin was perfectly cooked and again I loved the play of textures and flavors. The creamy potatoes with sweet and crisp snap peas, the hearty meat, and then a hint of sweet from the grapes. I could wax poetic about this one for days. As usual I was nearly stuffed to the gills when dessert and a dessert cocktail arrived at the table. The Bold Escape was a house infused coconut rum, coconut foam, pineapple and dark rum float. It could be a dessert in and of itself. The first dessert was Goat Cheese Cheesecake with a carrot cake bottom and a kumquat brulee, all atop a purple carrot and cinnamon puree. If you like goat cheese, you'll like this cheesecake. It was earthy, moist, dense and relatively savory as far as desserts go. I really liked it. 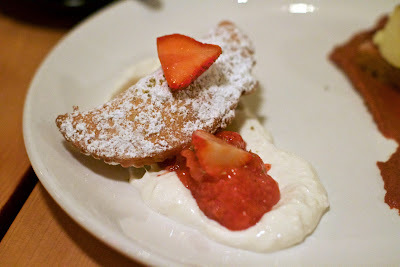 The second dessert was a Strawberry Rhubarb Hand Pie with ginger sour cream and fennel pollen. From the first bite this dessert brought on a rush of childhood memories. As a child I would save up my spare change so I could get one of those Hostess fruit pies in the school cafeteria. This is the grown up version and oh so much better. Pretty much all strawberry rhubarb desserts have a special place in my heart (they are among my dad's favorite), so I'll always give them a try and this was worth every caloric bite. As an extra special treat to end our tasting dinner, Chef Forrest brought out his infamous Smore's dessert - ridiculously gooey chocolate cake on charred marshmallow and sprinkled with graham cracker crumbs. 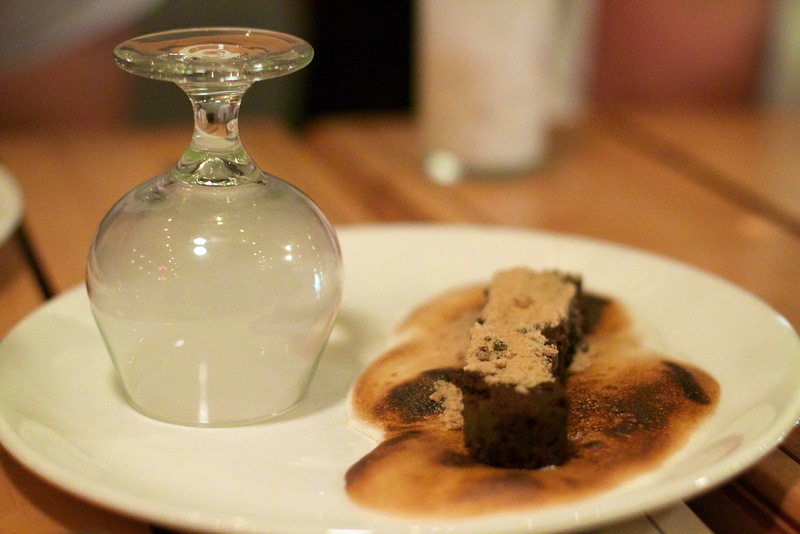 The coolest part though is that trapped beneath an overturned glass is ... wait for it... hickory smoke. As the dish is served they lift up the glass to release the smoke. It smells like you are at a campfire. This dessert is a total sensory experience. I only had room for a couple of bits, but it's so darn good. To quote someone at our table: "I want to flip a @*% table it's so good." I don't think there could be a better ending to a delicious summer evening. With the relaxed casual vibe and elevated yet approachable dishes, Bailey's Backyard remains one of our favorites. Everything looks so good! And love that hickory smoke addition! The hickory smoke definitely takes the dish over the top. Ridgefield is a bit too far...but looks yummy! If you are ever in the area I highly recommend stopping in. Good food but iffy service-don't go for lunch if you are in a rush.